Trade rumors? Staring contests? There could be that and more as the Seahawks join 31 other teams at the NFL combine this week. From afar, the NFL combine is easily perceived as just a bunch of future pro players running 40s and lifting weights — the “Underwear Olympics’’ as it has been lovingly and not-so-lovingly called. But the reality is a little different. For one, the interviews of the players that teams can conduct (teams are officially allowed to bring in 60 different players out of the 337 or so who will be there for 15-minute meetings) and the physicals performed are as important as anything shown on television. And the combine in Indianapolis also serves a larger purpose as something of an NFL convention, a rare time when every coach, assistant coach, general manager, player personnel exec, scout and agent (not to mention media member) gather in one spot for a few days where, to paraphrase Thin Lizzy, the drink will flow and the rumors will spill. 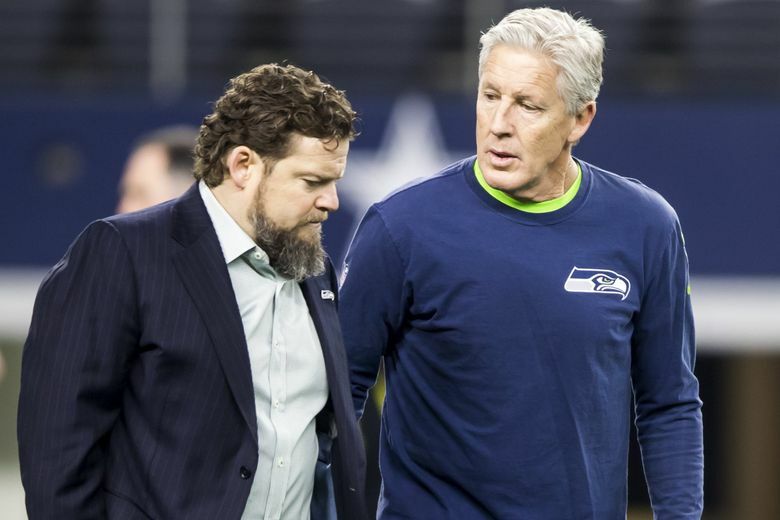 Coaches and general managers of many teams meet with reporters in official sessions Wednesday and Thursday, and Seattle is no exception, as general manager John Schneider is scheduled to talk Wednesday and coach Pete Carroll on Thursday. For each it is their first group interview session since the end of the 2018 season (or in Schneider’s case, since before last season began). Don’t necessarily expect direct answers to questions about Russell Wilson’s contract or things of that sort, but the media will try, and if nothing else, the sessions generally serve to begin shifting the conversation to a new season. Speaking of Wilson’s contract, the combine — as noted above — also serves as an incubator for all kinds of rumors of comings and goings, especially with the free agent signing period just around the corner, beginning March 13. As we’ve written, though, Wilson isn’t really the most urgent action item for the Seahawks because his contract goes through the 2019 season. More pressing is dealing with the team’s dozen or so players set to be unrestricted free agents (a number that can shrink or swell at any time if players re-sign or if restricted free agents are not given tenders), including Frank Clark, Earl Thomas, K.J. Wright, Justin Coleman, J.R. Sweezy and D.J. Fluker. Clark is widely expected to get a franchise tag if no long-term deal comes together now — the tag period runs until March 5 and whether Seattle will use it is a question Schneider and Carroll can expect to get at the combine. The agents for other players, meanwhile, will begin to get an even better sense of the market for their clients, as will the teams get a better sense of the market at every position, helping set the stage for the free agent chaos to come in March. Maybe the most interesting of that group to watch from a national perspective is Thomas, who is basically being regarded as a former Seahawk even if he technically remains one until at least March 13. The Cowboys are expected to make a big run at Thomas, but there could be other suitors as well. Seattle heads to the combine with just four selections in the draft in April — in the first, third, fourth and fifth rounds — thanks to trades for Duane Brown, Brett Hundley and Shalom Luani costing them their second-, sixth- and seventh-rounders. Maybe the safest bet in these most uncertain times is that the Seahawks will not make just four picks in the 2019 draft. No other team at the moment has fewer than five, and Seattle has a history of trading its picks to acquire more — it has not picked in its original first-round slot since 2011. Talks between GMs go on 365 days a year. But meeting face to face at the combine figures to help further facilitate negotiations Schneider is surely having to set the seeds for trades down the road, even if any trades of picks might not come until draft day itself. And who knows? While Seattle doesn’t appear to have a lot easily tradable commodities on its roster after the veteran purge of last year — or players it would want to trade — maybe something surprising will develop. Well it worked last year. Recall that it was at the 2018 combine when the Seahawks made news when it was revealed they had asked punter Michael Dickson — then an aspiring pro from the University of Texas hoping to do whatever he could to make a positive impression on teams — to take part in a staring contest. Further questioning revealed that the team was the Seahawks. As we know now, whatever Dickson did in the staring contest was good enough to get drafted and turn in a rookie season that basically was the best by a punter in Seahawks history.